When it comes to modest fashion, H&M has become the destination for stylish shoppers looking to cover up. Why? After launching the sellout LTD collection back in May (which celebrated modest silhouettes featuring kaftans, blouses and long ruffled skirts), the brand has established itself as a go-to for those searching for modest pieces that nod to seasonal trends. We've discussed at length what it means to dress modestly, but this collection wasn't simply about making sleeves longer and necklines higher. Its offering consisted of carefully considered pieces in flirty prints and textures. Key items included kimono-inspired dresses (which could be styled over jeans and trainers) and wrap-style maxi skirts that are perfect for cocktail hour. One influencer who's a fan of the inclusive thinking is Amira Khan of Modest Mira. Amira has totally mastered the art of covering up, and we often turn to her for expert styling tips. She explained why she believes the collection was so successful, saying, "The H&M modest collection really does speak to women's empowerment and self-expression, with the co-ords and floral printed full-length dresses, in particular, being my favourite pieces. The colours within the range really stood out, too, including bright hues which gave off such a positive and bold feeling." 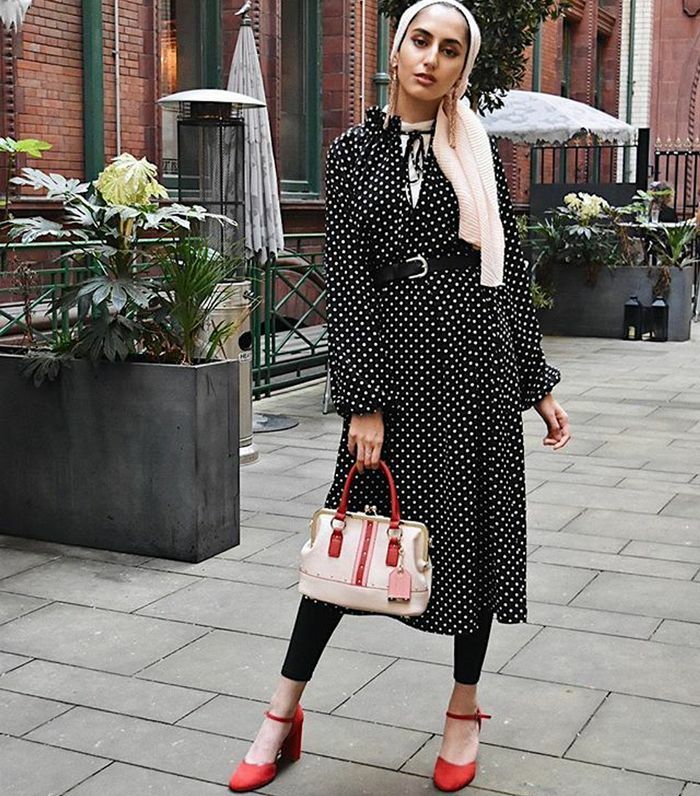 The modest LTD collection celebrated trends without baring all, and while those pieces have now totally sold out, Amira agrees that it doesn't end there, as we're finding H&M's wider collections offer plenty of covetable pieces that tick all the boxes for this style demographic. "H&M has always been a favourite amongst modest dressers, as the majority of the time, they do cater to guidelines we follow such as long sleeves, long-length dresses and skirts, and high necklines. However, they also keep within the latest trends. I feel H&M does offer more variety and options for a modest dresser," says Amira. Keep reading to see and shop our favourite modest pieces at H&M right now. We're wearing this pleated dress with knee-high boots and a slouchy cardigan. No wardrobe is complete without a puff-sleeved blouse. Wear with trainers now, and then layer it with a fine roll-neck and boots for the winter. Yes, brown is this seasons hottest colour trend. Just add white ankle boots. Take on two trends in one with this pleated checked skirt. You can never have too many pairs of high-waisted black leggings. Best worn with wide-leg cords and boots. This is your off-duty saviour. Inject a touch of colour to your autumn wardrobe with a pair of straight-leg trousers. This belted dress can be worn solo, over jeans or with the matching kick-flare trousers. We're still investing in co-ords, and this might be the chicest option we've seen this season. To be styled with autumnal knits and double-breasted blazers. This is ideal for layering. Or why not keep it simple and try this oversized white blouse? We can always rely on H&M for perfect printed dresses.